The Life Sciences Complex at McGill University opened its doors in September 2008 as a center for interdisciplinary, collaborative research across the life sciences. 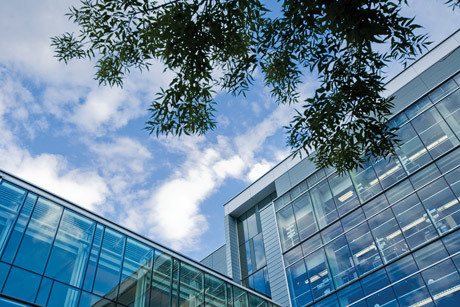 The complex is a 340,000 square foot system of buildings that houses over a dozen core facilities designed to encourage collaborative research across life science disciplines. The facility houses 60 principal investigators and 600 scientists. The Complex is built around five research themes: Developmental Biology, Cancer Research, Chemical Biology, Cell Information Systems, and Complex Traits, each of which has a dedicated floor of the building. Our laboratory is part of the Developmental Biology Research Initiative, but we often visit the labs in the Chemical Biology Initiative, where many structural biologists use the same tools for protein expression, purification, and biochemical analysis. Our building was named after Francesco Bellini, the founder of BioChem Pharma, the company that marketed 3TC, a renowned anti-HIV drug. We are grateful to Dr. Bellini for his support of the life sciences at McGill.